You can introduce ring training into your dog's every day activities. Whilst out walking, hold your lead as you would in the ring. Break into a pace suitable for showing your chosen breed of dog. Practice stopping and standing. Ask fellow dog walkers to ‘go over’ your dog. Get him used to strangers looking at his gums and teeth. If you are in an open space practice moving your dog as if he is in the show ring. Moving in a triangle shape and up and back in a straight line will get him used to what is expected of him in the ring. 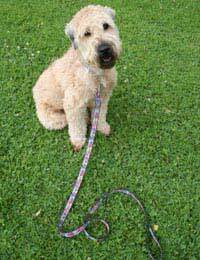 Most importantly get your dog used to moving on a loose lead rather than having the lead wrapped around your hand six times pulling the dog to your leg – this is because you are unsure of your own dog – practice will ensure you work as a team. These are becoming very popular events. You may find that your veterinary clinic holds puppy socialising classes. Remember though that these are not about showing a dog just to get them used to the big outside world and to learn a few manners. Tell whoever runs the socialising class that you intend to exhibit your dog so that the puppy is not taught anything that conflicts with ring training. You may find that other new puppy owners intend to show their dogs and already you would have made new friends in the dog showing world. The breeder of your puppy can give you help in preparing for the show ring. Apart from practicing to move your dog correctly, presentation is very important. The judge will not only be looking at the quality of the dog but also how he is presented and handled. Your breeder will be able to advise you on coat care and how to give that final shine to your exhibit. Hopefully the breeder will also be present at those first important shoes – in fact if your nerves get the better of you she should be prepared to show your dog for you! You should be attending ringcraft classes as soon as it’s possible for your puppy to enter the outside world. Puppies can enter shows from the age of six months, as most dogs cannot go outside until they have had their final inoculation at the age of twelve to fourteen weeks it doesn’t give you long to teach your dog and learn something yourself. The monthly match nights at your training club will be an important part of familiarising your dog with what is expected of him at those first shows. Do not get upset if you do not win. Do not get angry with your dog if he has a bad day. Take note of what happened, go home and keep practicing. But please remember we all take the best dog home with us!